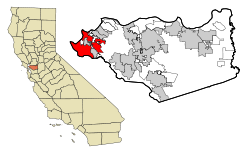 Richmond is city in the U.S. State of California. It is a suburb of San Francisco. 103,818 people live in Richmond now. Chevron has an oil refinery here; in 2012 the refinery suffered a large fire.